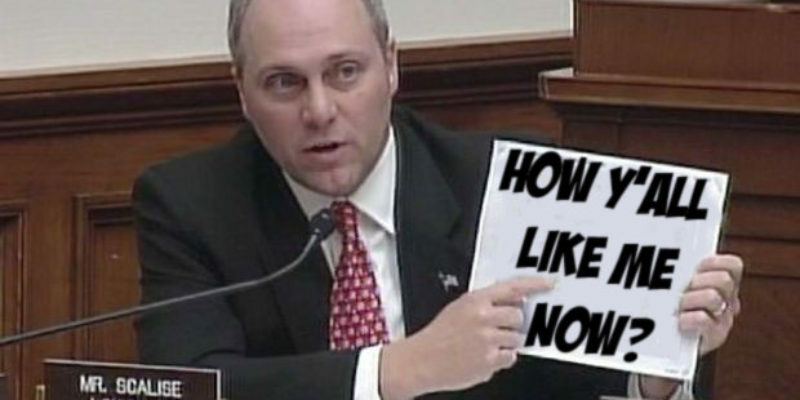 Steve Scalise has had quite the eventful day, and he’s hitting home runs every chance he can get. Earlier today, Speaker Paul Ryan announced his intention to retire, which basically opens the spot up for the man that might be America’s most popular congressman to finally take the reins of the House and provide consistent conservative leadership. And following that announcement, Scalise had the opportunity to interview Mark Zuckerberg, the most hated man in America, for four minutes- and those minutes Scalise did not waste. Unlike Senator Kennedy, Scalise landed on the questions that everyone wanted to hear and made Zuckerberg squirm in the process. What’s important in this clip is that Scalise is literally asking the questions that no one else seems to want to get around to. It’s easy for the Democrats to ask about Russian bots, or for a Republican to just talk about regulating the world’s largest social media site as Senator Kennedy did. Instead of copping out of asking questions that mattered, Scalise hit the ground running by establishing his credentials as a former computer programmer and then discussing exactly how Facebook was censoring conservative outlets through multiple methods, including a very taxing algorithm that has put at least two conservative websites out of business and crushes pretty much everyone else, including The Hayride. As you may expect from Zuckerberg’s incapability to actually answer a question or utter a word that wasn’t “um” during his Senate testimony yesterday, he didn’t hold up any better when asked questions by Scalise. His answer regarding the algorithm was exactly what the issue is with Facebook’s mindset: it was created, as far as they know, by someone who didn’t have a bias. Aside from the fact that every living human being has bias, Zuckerberg misses the point: the algorithm isn’t working. It is in fact destroying businesses and crushing a point of view, which is a major problem. If the goal of that algorithm isn’t to crush conservative viewpoints, wouldn’t it be prudent of a platform like Facebook to correct the issue? If Facebook is a place for all ideas, as Zuckerberg has said, why not fix the algorithm to target the Russian bot content that you are alleging exists on this platform, and allow conservatives to express their viewpoint freely and uninhibited? Wow. So, either the Obama campaign accessed a trove of information that Facebook was not aware of (or is turning a blind eye to), or the Obama campaign lied and did not access as much information as what they indicated. And now, thanks to Scalise, we have Zuckerberg on record for the questions that matter. Thank God that this man will be the next Speaker.